President Trump on Monday urged Democrats to "get to work now" on negotiations as a partial government shutdown enters its 24th day. Trump, who made the comment on Twitter, wrote in a second tweet that Democrats could "end the Shutdown in 15 minutes" and claimed that they are to blame for the funding lapse, which was sparked by demands that legislation include more than $5 billion for his long-promised border wall. "I’ve been waiting all weekend. Democrats must get to work now. Border must be secured!" he tweeted. "Nancy and Cryin’ Chuck can end the Shutdown in 15 minutes. At this point it has become their, and the Democrats, fault!" Trump continued, referring to Speaker Nancy Pelosi (D-Calif.) and Senate Minority Leader Chuck Schumer (D-N.Y.). 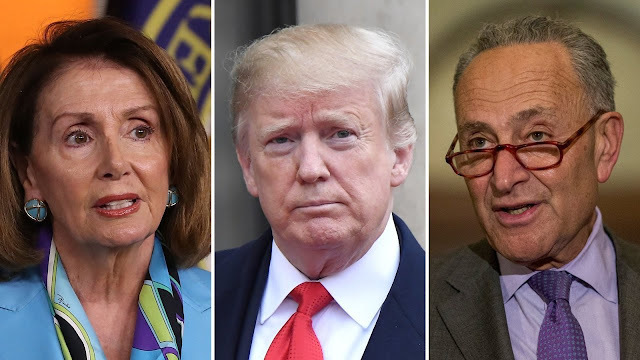 There have been few signs that the shutdown is nearing an end, with Trump continuing to demand wall funding and Democrats vowing not to approve any for the project. Over the weekend, the shutdown became the longest one in history, passing the previous record of a 21-day shutdown that occurred during the Clinton administration.